(The number of views for Sebastiao Salgado’s TED Talk.) I’m just going to say this, Salgado is the best documentary photographer alive. You could argue actual composition and style, and there are others that are good, but when you boil down longevity, impact, scale and influence there is nobody even in the same range. Now, I’m lumping guys like Edward Burtynsky in another category of work, but that is my own personal preference. And I don’t put Salgado in the “conflict photographer” group either. Perhaps I should define Salgado as a “classic documentary photographer,” but that would be confining because he transcends the traditional outlets and the art world, but ultimately that is not what this post is about. Can you guess what these numbers correspond to? Yep, you guessed it. Camera reviews. As you can see, these numbers are not even close, and oddly enough the geeks watching these reviews are planning (mostly talking) to hypothetically (Because most don’t actually make photographs.) do the kind of work that Salgado is doing only at an absurdly inferior level. Personally I think this is why people laugh at photography and our “geek” legacy. I also find this wildly depressing, and I think it’s been getting worse over the past decade. I think if the rest of the creative world actually cared they would feel sorry for us. Yes, I said “us” because I was spawned from the photography world. Multiple times per week someone asks me about gear, either what camera to buy or what I think of some new model. I have my standard, canned answers because frankly I detest talking about this stuff. “Whatever is small and whatever you are willing to carry,” is my number one response because I actually think this response is helpful and I truly believe it. When it comes to new cameras I have another canned autoreply, “I don’t know.” I should probably add, “I don’t care,” but that might sound a tad smug, so I’m currently holding back on that little caveat. Even if I wanted to keep up with the new models I’m pretty sure I would not be able to unless I quit my job, rid my life of all things meaningful and holed myself up with a case of Jolt Cola and some cheap hooch. But more importantly, WHY would I even want to do this? The absolute truth is your camera has so little to do with your images it’s almost irrelevant, but don’t tell that blasphemic tale to the masses sitting through unboxing videos. (There should be a minimal jail sentence for anyone caught hatching one of these devilish creations.) Heck, I did a test on my own YouTube page years ago with a “What’s in my Bag?” post and a “New Camera at Smogranch” blast. The “What’s in my Bag” video has almost 5000 views, which for me is massive because my mode of promoting my YouTube page is neglecting to tell people I actually HAVE a YouTube page. And to say the video is low quality is an understatement of supreme proportion. But something else dawned on me. I like old stuff. I like stuff that has been in my hands long enough to feel like it is actually mine. I like stuff I have a connection with. I’ve got a friend who buys almost every new point-and-shoot digital camera that comes out. No joke. All brands. Then he calls me and says “Okay, I’m serious this time, THIS IS THE ONE.” Then, two weeks later it’s on Ebay, and I get the follow up call. “Oh man, that piece of crap would’t focus and the skin tone was horrible.” I let him finish talking then I hang up on him. As you can see, I’m in need of new soles. I could buy new shoes, but I don’t need new shoes. I need new soles. These shoes finally feel like they are mine, and if anyone reading this knows me you know I wear these almost everyday. This will be my third set of soles for these particular babies. When I look down I know what I’m going to see, and more importantly I know what I’m going to feel. The same can be said for my camera. It’s the same boring model I’ve been using for twelve years. It’s not the only camera I have, but the rest, with the exception of one, have been with me for about the same amount of time and some much, much longer. (I did buy a new system in the last two years, but it was only new to me, and had already been discontinued roughly a decade prior to me acquiring it.) There is no guesswork. There is no awkward moment. There is no learning curve. In fact, the only thought I give toward them is choosing a format. That’s all I need. The burden of choice is lifted and I just going into the field to look and see. As many of you know, I’ve taught a few classes here and there over the years, both here at home and along some distant shores. Many modern students are defeated by the newness of their equipment before they ever set foot on photographic ground. I look over to see them staring at new everything, their conversation filled with menus, buttons and custom functions, not to mention the software woes on the backend. It just doesn’t work, nor will it ever. Now, if you love the gear more than the actual photographs, yes it will work, and there is no shortage of all things new. I say this not being contrite, but I’m entirely sure that many of those watching these camera reviews have no actual interest in making photographs. This is a reality of the photography world. My advice to you is two fold. First, get a camera, commit to it and put all the rest away in a locked compartment. Then give the key to a trusted companion under the promise that when you come to them in a sweaty frenzy claiming you REALLY need those other cameras because your Zupperflex 5000 is only good at street photography and your Zupperflex 5001 is the ONLY thing that will work for your softcore “poolside” glamour “work” your friend will, as promised, kick you in the teeth as hard as they possibly can. Second, use your chosen camera until it wears out. NOT until a new model is released, or a new software version flies down from the ether. USE THIS ONE CAMERA UNTIL IT WEARS OUT. I know a few non photographers who have done this. People who love to shoot for the love of shooting who never went down the equipment rabbit hole. They ask me to look at the mirror in their battered FM2 or their 5D Mark II shutter with 500,000 exposure, the camera in one hand and the shutter in the other. These people know, the have seen the light and know the light comes from what it in front of you, not what is in your hand. Find something and grow old with it. And people this is the FUN part, and I guarantee your imagery will IMPROVE. Less distracted photographer equals better photographer every damn time. And what’s so great about this is WHEN you imagery improves it illuminates the reality that the rest of the nonsense really doesn’t matter. Slowly your gear will become just a distraction because you will be consumed by your imagery, by the light at 3:43 PM, by a location or by something you haven’t quite put your finger on yet. Your gear will become a reflex used to scratch a creative itch and the thought of taking time to watch a YouTube clip about something new will finally strike you as absurd. It’s a learning process that has nothing to do with technology or screen time. It is about an ongoing conversation with good friends. Okay rabid Leica lovers….another little picture just for you. The Leica File: Seven from Smogranch on Vimeo. I’ve been in photography for over twenty-years and I can say with absolute certainty the Leica M camera is the most talking about, revered, despised, envied, lusted after, controversial, overrated, under-appreciated, limited, historical camera I’ve ever seen, heard of, been around or personally used. I’ve heard this camera described as “jewelry,” “a doctor, lawyer toy” and the “best camera ever made.” I’ve owned five Leica’s between 1990 and present day, and I currently use the M6 as my primary picture making tool. Because this camera is such a lightning rod, I thought it would be interesting to focus on a single image, made with this camera, and give a little background as to what was happening during the moment the exposure was made. I’ve used this camera for every type of photography I’ve ever done including weddings, portraits, documentary, commercial, news and journal keeping. It is rare I go anywhere without my M. For me it’s very simple. The camera is small, quiet and somewhat light. The camera does not attract attention, requires only a small, button battery that lasts a long, long time, and is very reliable. What I’m saying is I never have to think about it. Now, I’m showing these images not only because they were made with this particular camera, but more importantly they are images I feel are a good representation of the type of images I’m after. The final image is FAR more important than the device that made it. If I was only allowed to keep ONE piece of equipment for the rest of my photo-life I would keep my Leica M.
A few weeks ago I ran into a photographer I know, an Englishman, who travels as much as anyone I’ve ever seen. Technically, he lives in London, but I think there were horse and carriage in the streets the last time he was home. I mean it. You ask him where he’s going and it normally goes like this, “France, then NY then Toronto, then back to NYC, then LA for a day, China for two days, then home for eighteen minutes and back to NYC.” These people intrigue me because I know a little about travel. Not a lot, just a little. I’m always interested in ergonomics and realities of traveling as a photographer, especially when a DSLR and two zooms are not enough to keep your mind happy. So, I studied my friend. What clothes does he wear? Why does he wear them? What camera does he use and how does he travel with it? What bags does he use? Why does he use them? With a guy like this there is no fat, not just on him but in his method of operation. He doesn’t wear lace up boots through airport security…know what I mean. So I saw him making the transition from his rental car to his hotel room and he had exactly two bags, one shoulder bag, backpack of unknown make, and a case much like the one in these photographs. His had wheels on one side, but otherwise it looked just like the case shown here. This case was loaned to me by a friend, and after I saw my traveler friend with his case it got me thinking. Maybe I should use a case like this? Nanuk is the provider of this particular case. So, I dug out this case and began to fondle it, dreaming up how I could use it. Now as you can see, this is a small version, not good for taking my entire rig, but I used this more as a study of what this case can do. After about five minutes with this I realized, just about anything. It’s built like a tank. It locks. It’s waterproof. That in itself if enough. Right there. Done. Considering the travel I have coming up, a case like this is beginning to creep into my mind. The ONLY drawback I see is that it looks like a camera case, which means the hawks will be searching for it. But, if I sticker it up, scrape it up, etc, it should be somewhat camo. And, I would keep this case with me, as a carry on, just as my friend does. I would keep my backpack with me, and this case, and then check my clothes. Or something like that. The logistics, as you can see, I’ve yet to solve. Over the past few months I’ve seen several bags take four to five foot dives to the airplane floor as irate fliers shoved other peoples bags out to try and get theirs in. With a case like this I can just watch as I’m eating warm nuts. Like all photographers, I have a total bag fetish, so this Nanuk case will be added into the mix. I’ve yet to determine what will end up living in this little beauty, but something surely will. So I recently did a wedding in Hawaii. Turns out, the wedding was great, the weather held up and everything went as planned. After it was over, we decided to spend a few days snooping around the island and visiting friends. Hawaii is a very unique place in my experience, so any time I get a chance to explore or spend time I do. Staying with a friend we hadn’t seen in some time, it was great to wake up and feel the damp air, see the fruit trees growing outside the window and hear the falling of dense rain. The friend we were staying with is a photographer, big surprise, a really good photographer, and someone who has transitioned away from film, into digital, and now into motion. He is a wicked smart guy and has been at it for a long while. Stay tuned, an interview with him is on the way to this blog. About an hour later, in the middle of a conversation, our friend says, “Oh hey, I’ve got something for you,” and out comes what you see in this photograph. 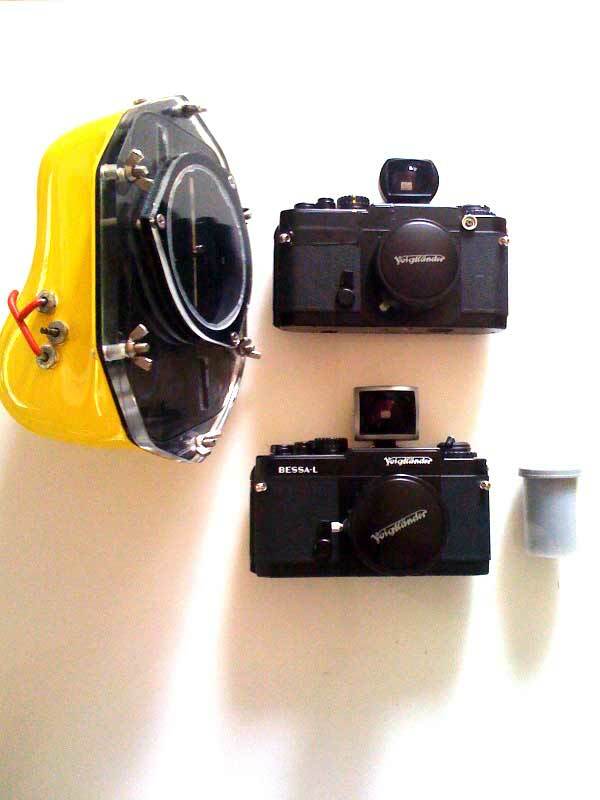 Two Voigtlander cameras, two lenses, two finders and a custom underwater housing. Now it takes a lot to get me really excited. This got me really excited. I don’t know the first thing about shooting underwater, but I love being underwater, so I’ll learn what I can. But what I’m excited about is the idea that these new cameras will allow me photographs I can’t make with my existing gear. I don’t have a 12mm. Let alone a rectilinear 12mm. I can mount this thing all over the place, including my bicycle. I’ve been dreaming of having something like this. So as I packed up to fly home, my trusty Tenba bag, the Ultralight, was no longer as light as it was when I left. Inside were five cameras instead of three, and for this I am truly grateful to my friend. I’ll try to use these things and make something worthy.